DnBuster's Place: GERITOL® MULTIVITAMIN "walks the walk"
This is a sponsored post written on behalf of Geritol. I received free product in exchange for this post. All opinions are my own. Discover howGeritol®Multivitamin, a leading, trusted multivitamin for men and women with 26 comprehensive essential vitamins and minerals, finds the right balance for your body. Even a healthy diet may not provide your body with all of the vitamins and minerals essential in human nutrition. That's why some of you may take multivitamins to ensure your body receive all of the nutrients they need to stay healthy. Yet, so many multivitamin products today offer mega-doses of the nutrients that our bodies need. As a trusted multivitamin for men and women since 1952, Geritol® Multivitamin still contains all essential vitamins and minerals in one tablet, but is specially formulated with just the right vitamins in just the right amounts so you can feel your best with less concern about vitamin mega-dosing. the U.S., including Walgreens, Walmart, and Meijer. Cost: 100-count bottle is available for a suggested retail price of $11.99. including the American Heart Association local walk sponsorships, visit http://www.geritol.com. 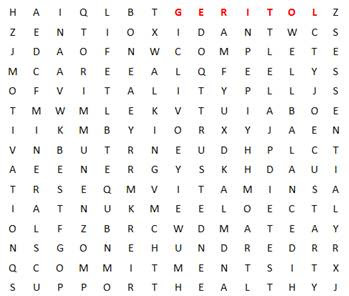 To help remind you why Geritol has been a trusted name in health for years, I wanted share this “Discover Geritol Multivitamin” crossword puzzle! There are 26 words that show why Geritol “walks the walk” as a leading right-balanced multi-vitamin. 26. WELL~Balanced was the BONUS PHRASE! Geritol awarded one reader of Dnbuster's place that identified the mystery combo word(bonus phrase) a “walks the walk prize package” This prize package will contain two Geritol pedometers (one for them and one to share with a walking buddy), Geritol® Multivitamin product, and a $25 gift card toward a pair of New Balance sneakers so that one of my reader can get up and out and move for better health. !! Congrats to LaTanya of SC ~She correctly identified the bonus word and won the Walk the Walk prize pack! !